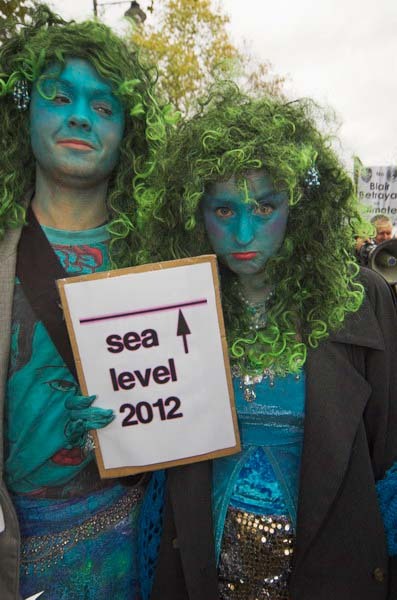 The first protestI photographed organised by the Campaign against Climate Change (CaCC) took place in March 2002, though I had come across the organisation and its founder Phil Thornhill the previous year at a climate protest at the US Embassy organised by the Green Party. 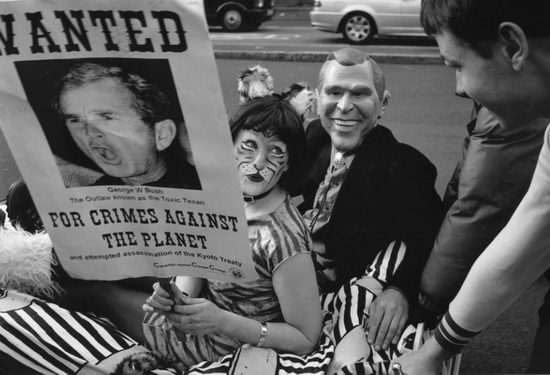 The US was then and remains the chief villain in our fight to save the planet from extinction, and it was then Preseident Bush who was in bed with the fossil fuel companies, notably Esso, whose advertising campaigns claimed to ‘put a tiger in your tank‘. So CaCC literally put a very attractive female ‘tiger’ on a bed with an activist with a George Bush mask and began pushing it towards Parliament from the gardens of the Imperial War Museum, with the tiger holding a placard showing Bush ‘Wanted For Crimes Against The Planet’. The bed was on castors, and to begin with rolled along smoothly, but as we got to Westminster Bridge, disaster struck. The castors were designed to make it easy to move the bed around in a room, not for long distance, and certainly not to take the weight of a single bed loaded with two people, and one fell off, ripping out the screws from the wooden base, and there was no way it could be replaced. There were more protests in London by CaCC I photographed over the years, particularly the annual march they have organised at the start of December, and 2018 was no exception. This year’s march began at the Polish Embassy, and we practised slogans in Polish as well as listening to speeches before the march set off, and you can see some of them on placards. UN climate talks were due to begin in a couple of days in Katowice, Poland, and it was very worrying that they were being sponsored by Polish fossil-fuel companies, producing some of the dirtiest fuel currently in use. 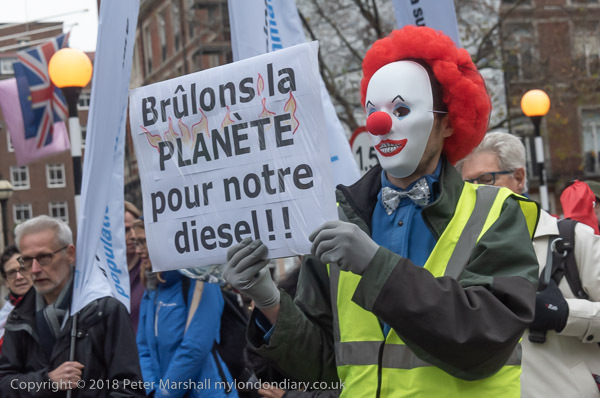 One campaigner came dressed as a ‘gilet jaune’ and with a placard ‘Brulons la Planete pour notre diesel! !’, presumably meant as an ironic comment on the French protesters whose protests were first ignited by increases in the cost of fuel, particulary diesel. But as the protests across French cities continue it has become clear that they are not about the price of oil but reflect a deep disatifaction with the way society is run by elites with little regard for the majority of the population. I don’t know what it will take to get the British public to wake up to the seriousness of the situation over climate change. 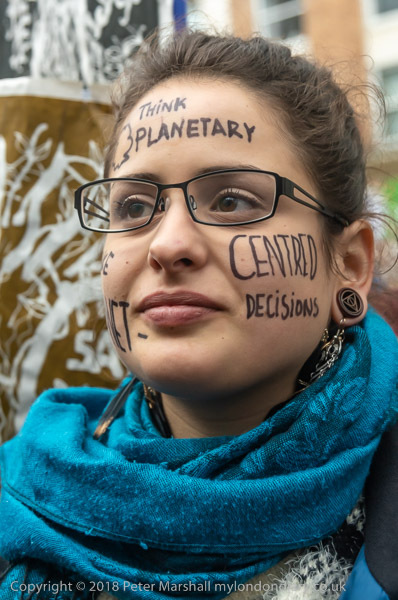 It was good to see people from Extinction Rebellion taking part in the march and speaking; but the high-profile actions by XR have only so far touched a minute fraction of the people. It’s a start, but I’m unsure it can really take off, or that its strategy will work. 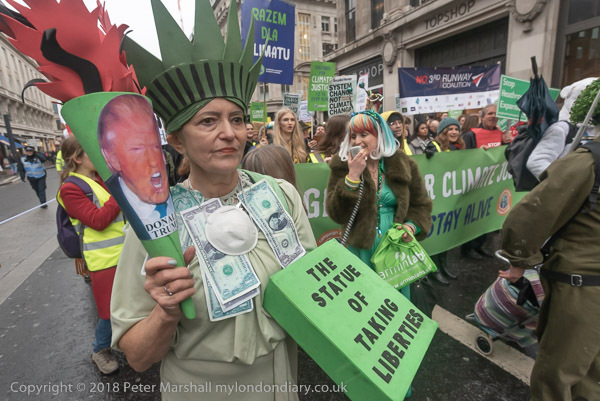 It is certainly an uphill struggle, against the complacency of our political parties, who listen far more to the highly paid lobbyists working for coal and oil interests than to scientific evidence or protests such as these. Uphill against the dominance of the media controlled by a handful of billionaires pursuing short-term interests in dirty energy and polluting products. And a national character that grumbles in private rather than gets out on the street in protest. At some point there will be a series of disasters that will finally prompt politicians into action, though the lesson from Grenfell is that one huge disaster won’t be enough – but will just be subject to the usual cover up and long grass. By then I fear it will be too late. But while there is still some hope we need to battle on. This entry was posted on Tuesday, February 5th, 2019 at 09:40 am and is filed under My Own Work, Political Issues. You can follow any responses to this entry through the RSS 2.0 feed. You can leave a response, or trackback from your own site.